Operating on the premise that all Monotheism derives from the collective unconscious one may be able to describe and analyze the Creator’s biography during the centuries based on His Holy Books. These scriptures must, of course, be considered as having been written by humans who have been living under certain circumstances which have to be investigated in great detail in order to understand their content. It is historical, or higher, criticism of literary analysis which is of sole interest here. While undertaking the task it becomes obvious that religiosity itself, even spirituality, would definitely impede any analytical approach. Religiosity as an interesting aspect of humanity should be considered a topic for investigation. It must not be the thriving force and motivation for the investigator. One striking attempt has been made 15 years ago by Jack Miles in his much acclaimed Pulitzer Prize winning work God – A Biography (Alfred A. Knopf, New York 1995). Miles, who was born in 1942, has been a Jesuit seminarian early in his life. There are very few moments, if any, in the book when the author’s religiosity might disturb the (non-religious) reader in following his arguments. The book describes the development of God Almighty, from His early creations and statements mainly as an at times brutal, natural force spreading fear and terror, to a warrior, a commander of His chosen people, a lawgiver, etc; clearly a process of maturation and civilization. The most interesting chapter is, of course, that about Job with Jack Miles’ notion that, after God’s and Satan’s embarrassing bets on the steadfastness of pious land owner Job who, as a consequence, lost almost everything, God first re-emerged as a volcano-like natural force, but then (according to the order of the books in the Tanakh) never spoke to men anymore. Job effectively silenced him by his responses to God’s outrage. God was afterwards described as the “Ancient of Days” as, for instance, in Dan 7, 12-14; a neutral (?) bystander, carefully watching what humans do, but not interfering anymore. Books like Daniel, Esther, Ruth, and others had been written when Persia had emerged as occupying power in Palestine granting sort of peace for a couple of centuries. Jack Miles explains to us that that changed dramatically when the Jews were hard-pressed under Roman rule, forcing God to personally appear on Earth as Jesus Christ (Jesus – A Crisis in the Life of God, Arthur A. Knopf, New York 2001) in order to prepare them for more terrible events to come. Again, Miles’ approach is a literary one (although his religiosity is more noticeable and bothering than in God – A Biography). The New Testament is described here as a glass painting, a beautiful piece of art, through which the true, “historical” world in, say, 30 to 60 CE may be viewed in a blurred and distorted way at most. So, Gods biography went on! And eventually He adopted pacifism and even a most difficult to comprehend form of martyrdom . All of this must, according to Miles, be seen against the background of threats and, finally, acts of extermination. The Jewish vassal state of the Roman Empire vanished when Jerusalem and its temple was destroyed by the Romans in 70 CE and, at the latest, under Hadrian’s brutal crackdown on Simon Bar Kokhba’s rebellion in 135 CE. Both events have been engraved into the collective conscious of Jews as Shoah-like massacres. After having read Miles’ books, I was wondering that something was missing. Since Jesus in a permitted interpretation of His martyrdom failed so much, one may be able to expand Miles’ idea. Maybe He (God) has revised His decision to bring peace to Earth. Maybe, the old lawgiver (and avenger) decided that it was overdue to teach His creation manners. So, Islam emerged as the final version of fundamentalist monotheism. I recently wrote about some of my thoughts which crossed my mind when reading eminent German Orientalist Tilman Nagel’s recent spin-off Allahs Liebling (“Allah’s Darling”) about origin and manifestations of “Mohammedanism.” His maximum opus is, of course, “Mohammed – Leben und Legende” (“Life and Legend”, Oldenbourg, Munich 2008), more than one thousand pages of a narrative review of Arabia in late Antiquity. The book has been highly acclaimed by most scholars so far. Since the impact on the public was nil, the publisher announces a summary of Nagel’s results which will appear later this year. The book covers much of pre-Islamic 6th century and goes way beyond Muhammad’s life in describing the reigns of the four rashidun, or rightly guided, Caliphs and several Umayyad Caliphs of the 7th century as well. While Nagel represents academic mainstream when considering recent attempts to describe or question the life of the prophet of Islam, he offers interesting insights in pre-Islamic Arabia where an ancestor of Muhammad, Qusayy (ca. 400-480) has brought a non-Jewish, non-Christian, Arabian monotheism to Makkah, which refers to Abraham (Ibrahim) the hanif. A High Religion, as he describes it . Nagel’s profound knowledge and the numerous original sources which have not been used so far do not prevent him from drawing an utterly negative picture of the Prophet of Islam. One might in fact get the impression that Nagel wants to make Muhammad basically responsible for cruelties, assassinations, even massacres, and abuses of the very time when he was living. His life, so Nagel, was dominated by power intrigues, sexual obsession. As everybody knows, Muslims hold Muhammad as fallible human being . Nagel talks consistently about his “alter ego” when he refers to revelations by Allah which later have been included into the holy Qur’an. It is unfortunately nothing else than defamation of Islam as Mohammedanism. In essence we know these tirades from fundamentalist Christians and Jews about the “false prophet” for centuries. In times of new crusades, poorly disguised as war on terror, and increasing intolerance in Western (‘enlightened’) societies it may even be dangerous. Nagel’s book is not expected to be even read by Muslims who would consider a biography about their Prophet, which had been written by a Western scholar, ridiculous anyway. It would have been more interesting to read a description of the circumstances of daily life; traditions, faith and superstition, etc., on the Arabian Peninsula in the 6th and 7th century and to compare these with those in, for instance, Palestine, Constantinople, Ctesiphon, etc. . As a matter of fact, unwritten tribal laws (the society was largely illiterate) were definitely brutal in the Hejaz and other places in Arabia (comparing Western values, some still are), and new ethics and a lawgiver were overdue. As an example, Muslims do not cease to praise Muhammad’s efforts of banning the former custom of burying female infants alive. And, divine law has a great tradition in Antiquity. Since biblical lawgiver Moses is the prophet who is mentioned by far most in the Qur’an, he was in a way Muhammad’s role model. The hijra and the exodus: two aspects of the same coin. According to Nagel, there is evidence that Mohammad has been on a “straight path” during all of his life despite his oppression and powerlessness when in Makkah and his development into a warlord after the hijra. Despite the differences in the tones of the suras revealed in Makkah and those lawgiving ones revealed in Madinah. In particular Nagel’s observation that Muhammad usually speaks about ‘a book’ when he refers to the holy Qur’an seems amazing . The comprehension of learning and teaching reading and writing may have convinced the pious merchant in Makkah that it was most probably a divine demand . When Nagel interprets, in the last chapter of his book on the development of Islam after the death of the prophet, the inscriptions at Jerusalem’s Dome of the Rock, he certainly has Christoph Luxenberg’s re-reading of the inner face of the Dome’s octagon in mind (without even mentioning him) which might be one of the more absurd undertakings of the Inârah Institute at the University of the Saarland in Germany . Luxenberg reads muhammad(un) as the “praised one” and refers it to the following Jesus, “the servant of God”. In one of the appendices, Nagel also addresses the group’s spiritus rector, Karl-Heinz Ohlig, who denies the existence of the prophet and considers early Islam as a special form of Christianity. While the odd and revisionist members of the Inârah group consider themselves as adherents of historical criticism, more serious Nagel fails to oppose re-emerging outsider opinions as regards the life and legend of the Prophet of Islam. His profound Orientalism, pre-occupation and, in particular, presumed religiosity which is, of course, rooted in Christianity may all prevent him from having a fresh and sober look at the origins of one of the great monotheistic religions, that one which is currently of great concern. Miles describes the shock a member of a different culture and or religion, say, from Japan, would perceive if someone has to explain to him that Christians worship a corps nailed to a cross. Or if he or she is told the story that Jesus’ blood and the body has, as a rite, to be consumed for forgiveness of their sins. When I, with my background in Christianity, was ‘enlightened’ by Miles, I fully understood. What bloody cult is the Lord’s Supper, or Eucharist, just before Jesus’ crucifixion! Miles later describes that thousands of Jews were terror-executed by Roman occupiers in particular in 70 CE. Palestine’s hills were deforested in order to provide executioners with sufficient wood. So, Jesus’ suffering was only the beginning of the misery, not salvation. Nagel’s semantics is not always very precise. One might get the impression that a scholar writes who seldom leaves his ivory tower at the university and doesn’t know how ‘normal’ people talk. His frequently used adjective “hochreligiös” means deeply religious but generally refers to the hanifs as adherents of a High Religion. Not to complain about his erratic diction. Imami, or Twelver, Shi’ites may have a different view. The Prophet himself, his daughter Fatimah, his son in law Ali, their two sons Hasan and Husayn, and the other nine imams are regarded infallible. More dedicated to historical criticism Patricia Crone has afforded such an undertaking in the mid 1980, in a much more stringent way, when trying to trace some facts and myths about trades in and around Makkah at the time of the Prophet. Nagel translates iqra’a with “rezitiere”, or recite, others with rehearse, proclaim aloud, etc. Translations from Arabic to other languages have been described as extremely difficult. Muslims usually do not regard translations of their holy book as holy or authentic. A rather clumsy example which may bother the reader several times in Nagel’s book is the eulogia which should be added whenever the name of the prophet is mentioned, Sallalahu aleyhi wasallam, commonly translated as “peace be upon him!” Nagel translates: “Allah und seine Engel vollziehen gegen ihn gewendet das rituelle Gebet.” With the help of Google translate, I got the following: “Allah and his angels, turned against him, perform the ritual prayer”, which suggests an apotheosis which is completely unknown in Islam. Luxenberg C. Neudeutung der arabischen Inschrift im Felsendom zu Jerusalem. In Ohlig KH, Puin GR. Die dunklen Anfänge. Neue Forschungen zur Entstehung und frühen Geschichte des Islam. Verlag Hans Schiler, Berlin 2005, pp. 124-147. 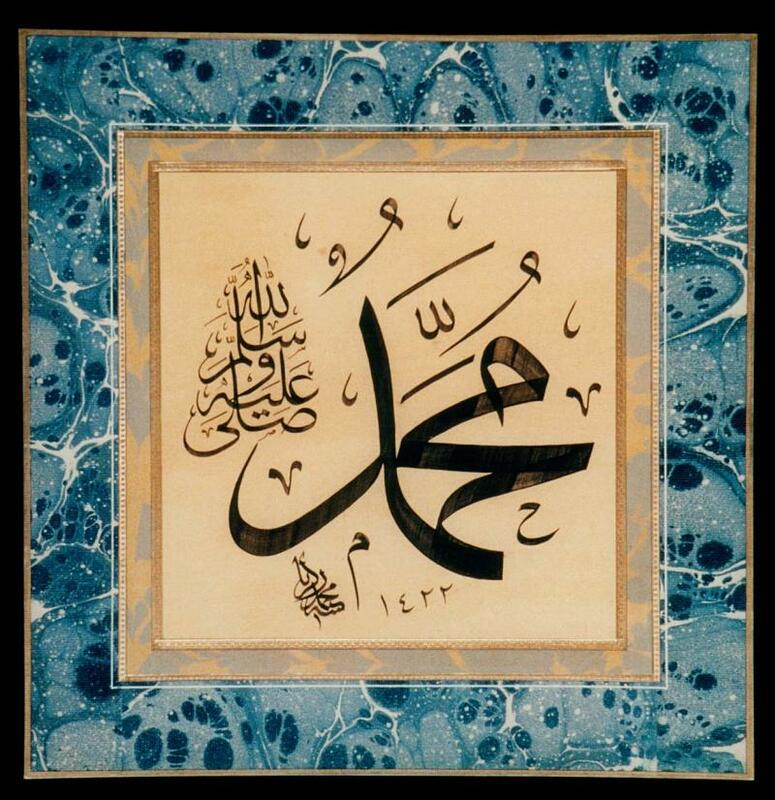 The picture is contemporary Islamic calligraphy by Master Muhammad Zakariya. See also on this blog: Not Everybody’s Darling. Orientalist Tilman Nagel’s attempt to re-establish Mohammedanism. This entry was posted in Academics, Book Review, Christianity, Islam, Judaism, Religion and tagged Christoph Luxenberg, Inârah Institute, Jack Miles, Karl-Heinz Ohlig, Prophet Muhammad, Tilman Nagel. Bookmark the permalink.